Easter Eggs are secrets that the developers put in games to give people a laugh when they find them (provided that they understand the joke or reference). Redguard has a large number of such jokes. Easter eggs differ from in-game references in that they have been clearly hidden from the player and are unusual with regards to their surroundings; references are often integrated into the rest of game and no attempt is made to keep them secret. The runes on the left side of the Dwarven Ruins door read HI, NO, ST from top to bottom. The right side is just these runes flipped horizontally. According to Michael Kirkbride, the area used to not be accessible and you had to take another way around, which is what "no street" refers to. On the map of West Tamriel, there is a town in Hammerfell called Shady Grove. This is also the name of a road and a metro station near Bethesda's offices in Rockville, Maryland. In the room shown at the beginning of the introduction, there is a bookshelf containing titles of past and future games in the Elder Scrolls series. The first two, Arena and Daggerfall, are easiest to see. Three more are also visible: Morrowind, Oblivion, and "Romanelli". Redguard was released years before Oblivion, though obviously Romanelli was given a different name. The book from the introduction titled The Elder Scrolls Adventures volume R contains a few interesting things. 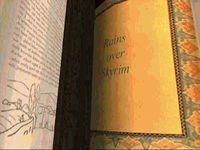 As the pages are flipped through, there is a page with the words "Rains over Skyrim". The other text is taken from The Adventures of Hajji Baba of Ispahan, an 1824 novel by James Justinian Morier. The beginning of Chapter VI and a part roughly halfway through Chapter XI are able to be identified. If you approach Mariah with a torch, you can light her on fire, resulting in an explosion. She will disappear and Cyrus exclaims "Magnificent! ", possibly because many people including some of the developers consider her "the most annoying person in the game". In Redguard's insider on the official website, John Pearson says Dram was inspired by "a well-known bounty hunter from a galaxy far, far, away", clearly Boba Fett from Star Wars. Dram is similar to Boba Fett in both his aloof demeanor and role as secondary antagonist in the story. Michael Kirkbride has also said that N'Gasta the Sload was based off of him wanting to draw Jabba the Hutt. In his dialogue, Tobias quotes at least two historical figures. In-universe, these are all quotes from Frandar Hunding. "War is the continuation of politics." is part of a very well-known longer line from Carl von Clausewitz's On War. "Political power grows along the blade of a sword." is a localized version of "Political power grows out of the barrel of a gun." by Mao Zedong. "Be resolute, fear no sacrifice and surmount every difficulty to win victory." is taken straight from Mao Zedong. The bull at the Yokudan camp appears to reference the Ultima games. Cyrus talks to it and says the line "Blonde hair, anhk on his chest, been poking around that wagon. You know the guy I'm looking for.". This is a clear reference to the Avatar of Virtue, the hero of that series, who was commonly depicted as a blonde man with an ankh on his armor. Additionally, talking to a farm animal may be a reference to Smith the Horse from Ultima VI and later games (although Smith talks back).